Larger, stronger insert geometries promote longer tool life. Strong clamping screw for demanding applications. Ultra reliable machining performance at high feed rates. Premium milling grades to cut all materials. Latest post coat technology, provides superior bonding between the substrate and the coating layer. Ultra-strong super-free cutting insert geometry. 2 different insert geometries for application flexibility. Face Mill, End Mill and Top-on systems. 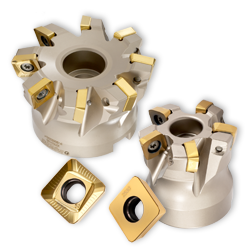 Premium milling grades ensures long lasting performance. Diameters ranges: 1.250, 1.500, 2.000, 2.500, and 3.000 inch.